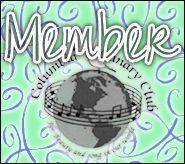 Click here for the 2014 waiting list. Available right now for shipping or pick up.. The following current offspring are with their parents! 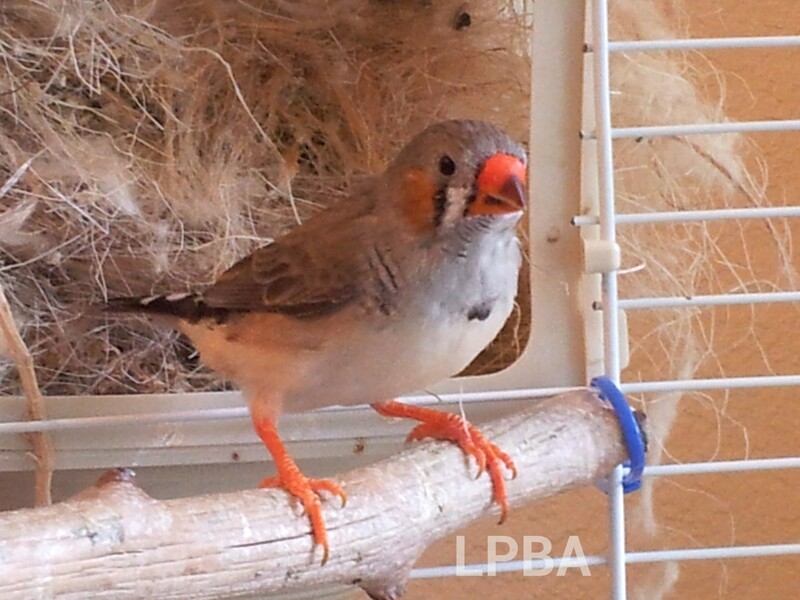 Check back in few weeks or so to see them after they fledge..
Brittany (Penguin Zebra Finch hen) enjoying some free-flying time in between clutches. I currently have a variety of color mutations. 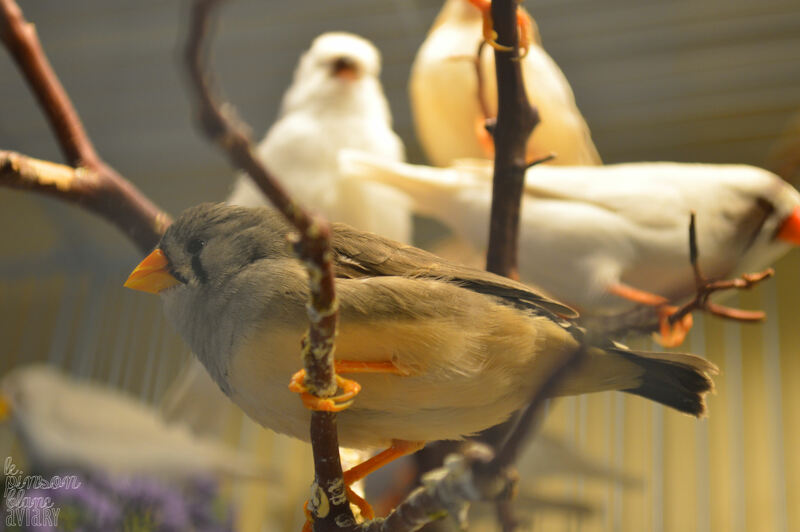 My pricing is based off of availability, rarity, difficulty to breed & quality. I am temporarily breeding 1st generation offspring until the end of this season which will be this Fall. Contact me for additional information on what I have available or to reserve a pair. Here is my adoption application. 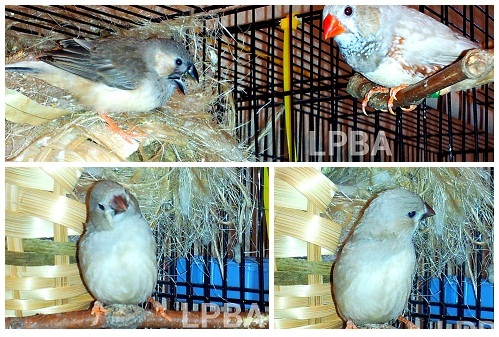 All pairs are divided into two breeding schedules. 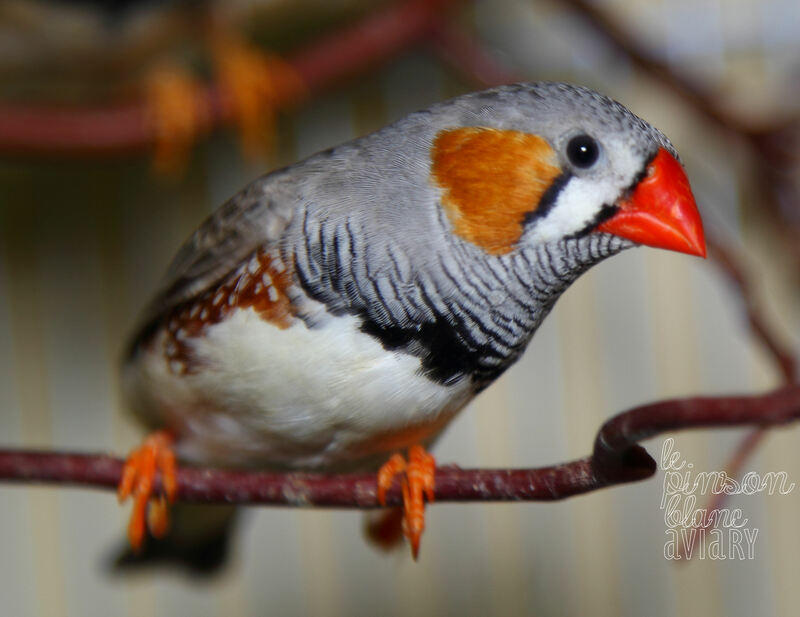 Some breed year round with breaks of up to 2 months at a time between each clutch, and some are on a 8-month-on, 4-month-off breeding and resting season cycle. This is to ensure the optimum health & well-being of every pair and their offspring. It also allows parents to choose how they want to raise their young. 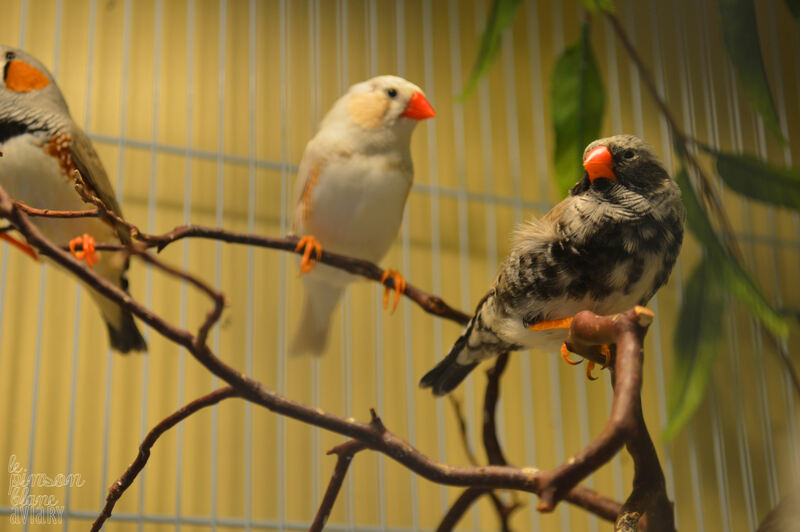 Some Finches prefer a longer time to wean their babies and others prefer a continuous cycle. 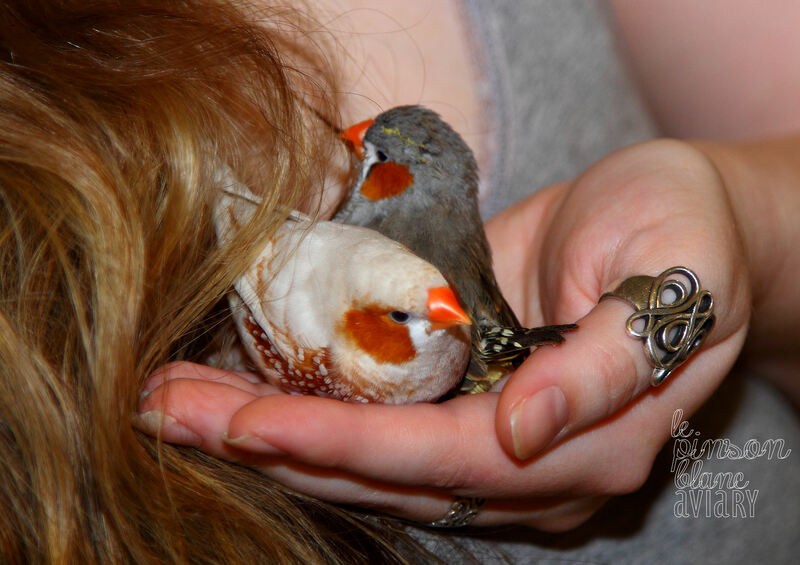 I do occasionally have young pairs born from generations of beautiful & happy Finches that I will adopt out as pets for a reasonable re-homing fee. 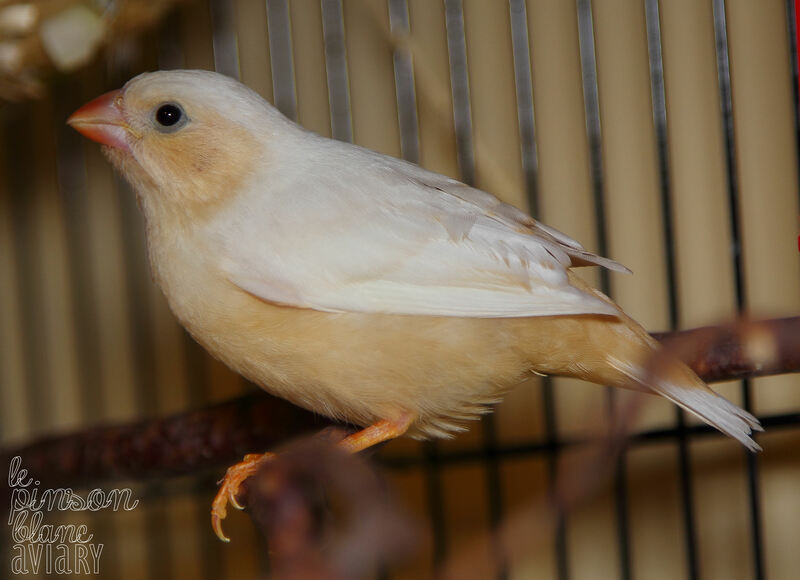 If you’d like to reserve a pair or find out when one will become available, email me at – whitefinchbreeder@gmail.com For more information about me, click here. I do take deposits, but only for birds that are already weaned. I also operate on a first-come first-serve basis. As a part of this policy I have a small waiting list for potential adopters. 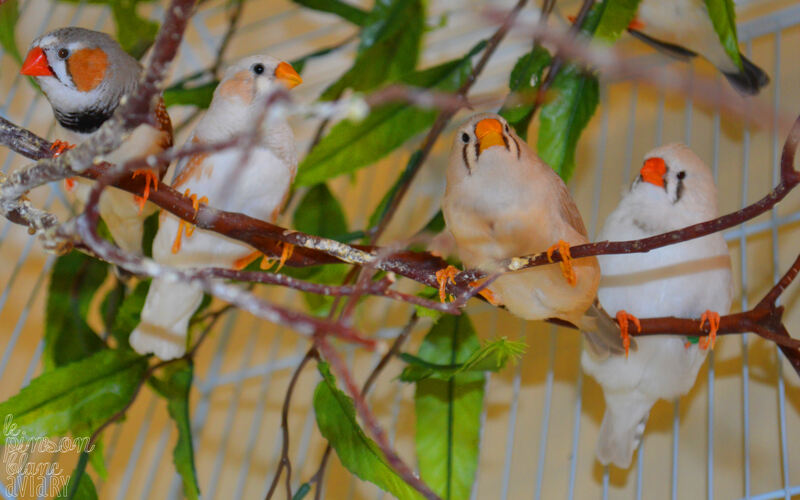 Hand-raising Finches is an extremely delicate process that takes practice and research to even attempt. I have been doing it since the aviary began and not intentionally. Parents push out or abandon their young (or eggs) sometimes before they are able to care for themselves which is where hand-feeding becomes necessary to save the life of offspring. 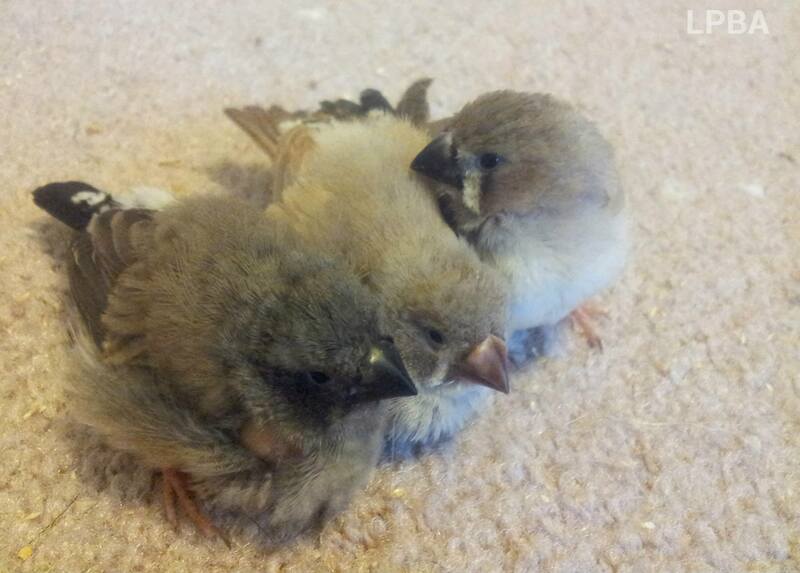 I do offer hand-tame pairs but only if I happen to have them available and for a significantly larger re-homing fee. 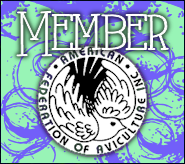 Hand-feeding does not always guarantee tameness nor does being raised as tame altogether. 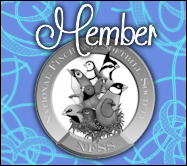 I am always available 24/7 for any assistance from finding a mate for an obscure bird or lending any information or advice regarding Finches. If I have the power to help, I will. If I don’t, then I will direct you to someone who does. I enjoy taking the time to help and answer any questions. 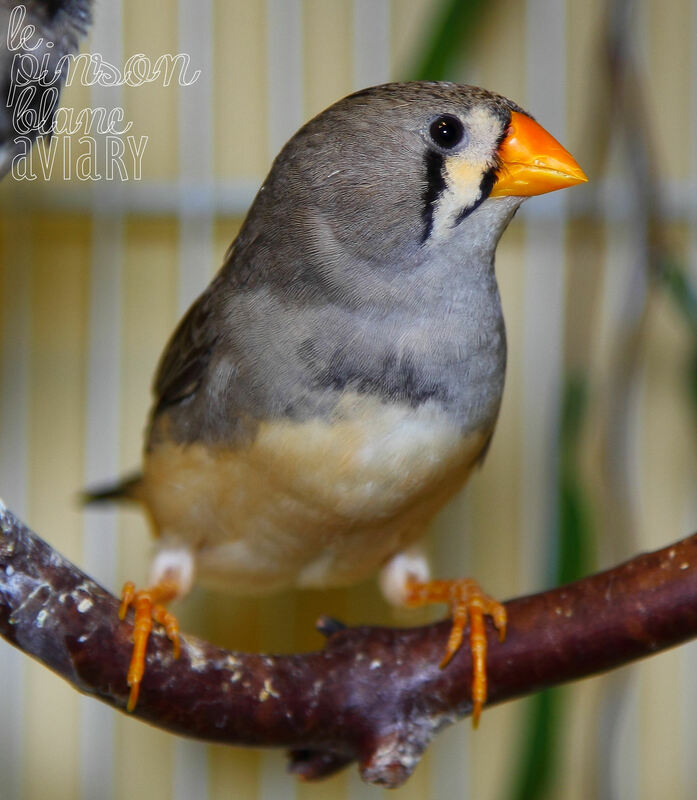 While you wait to adopt a pair, check out the about section for more info about me, the aviary, my Finches, prices, or what you’d need to take home a new pair of Finches. 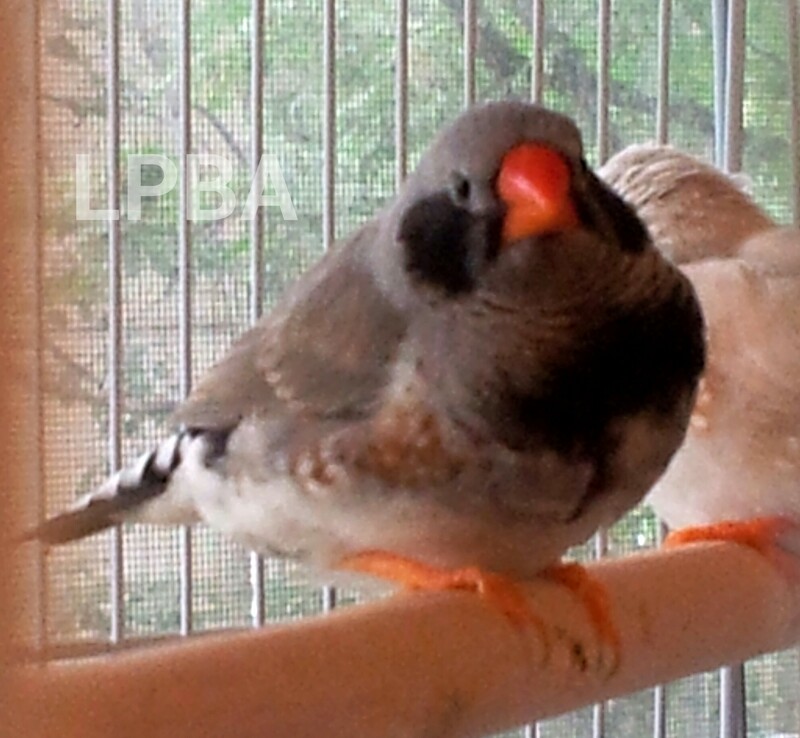 I breed regularly so keep checking back for more pairs as time goes on. 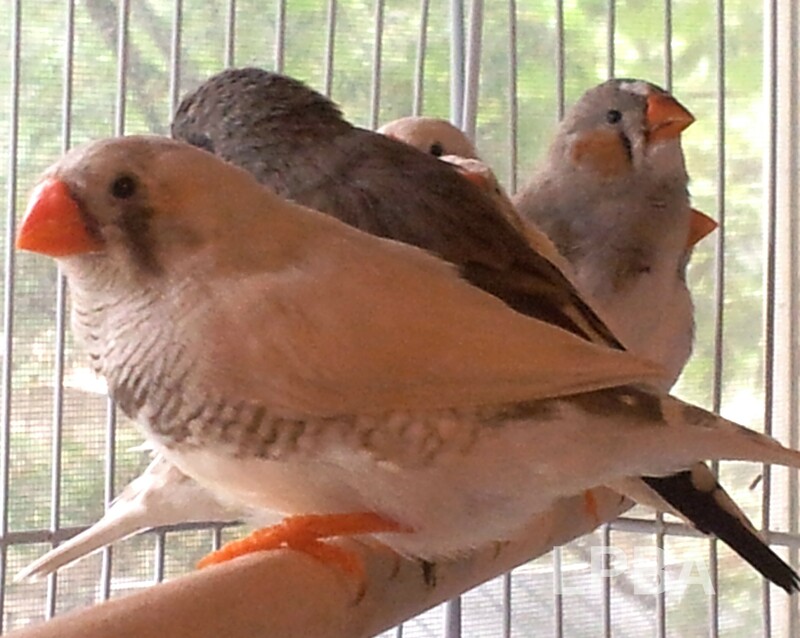 am interested in 1 or 2 female whites as my two “old gals” passed away and the boys are a bit lonely. Please let me know when you have any to purchase! Thanks for your inquiry, Diane! I literally just got another pair of whites and a pair of Black-cheeked Zebras [breeding between whites and the black-cheeks yields fawn colors and other mutations as I’m told]. I also just got some new nesting boxes, so as soon as everyone is settled into their new habitats, I’m sure they’ll produce some nice new clutches very soon! I’ll keep you posted! Hello, Ernie! 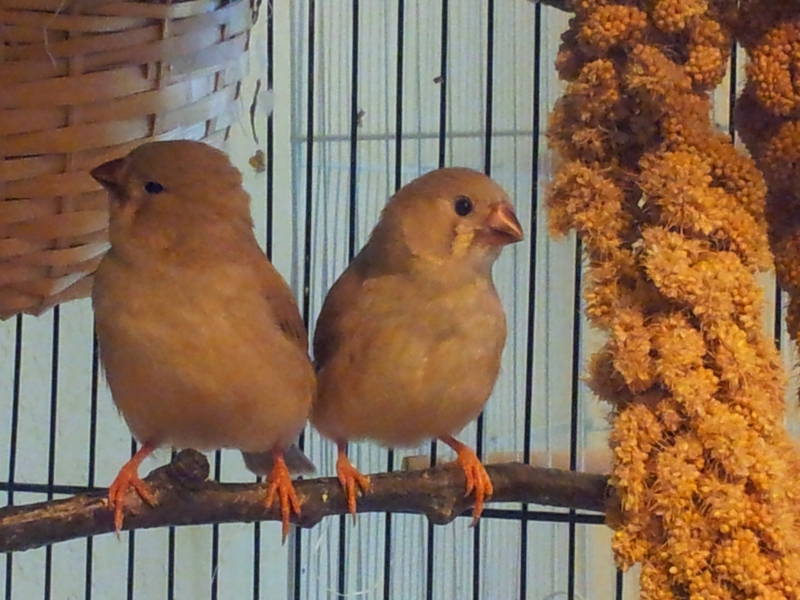 There are currently two babies still being weaned that will be available once they become independent. They are currently spoken for. I’ll add you to the list, and if you provide your phone number and email, I’ll let you know when two pairs are available for you. 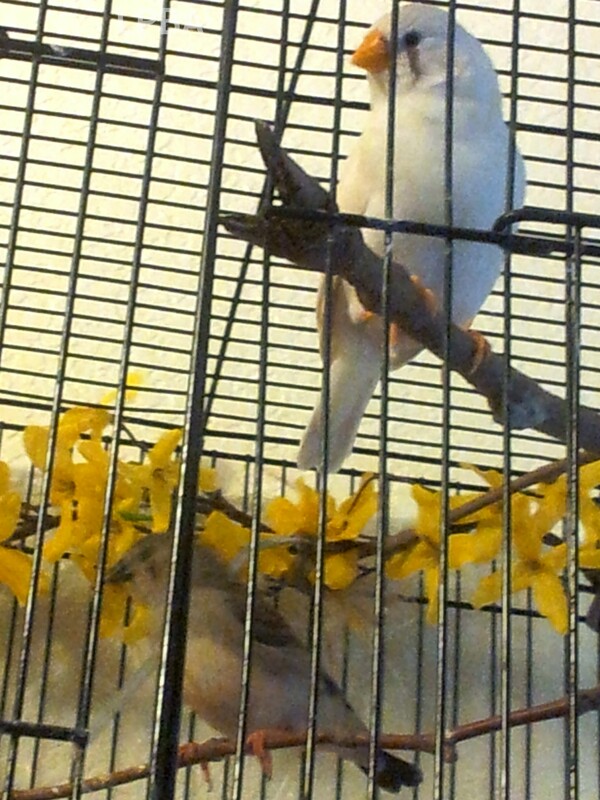 Am loving my new baby white finch….she snuggled up to my male this morning and he put his head on top of her and they stayed that way for a long time. So sweet. They were both in the nest all night! 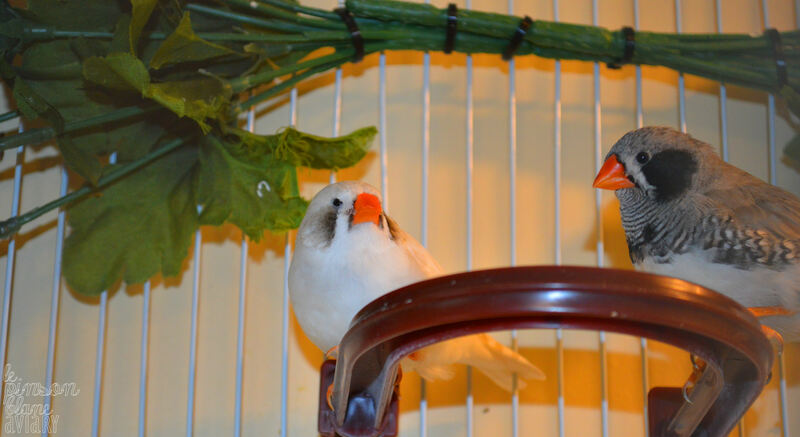 I think they are having fun exploring the new cage and all it’s fun perches and food trays. 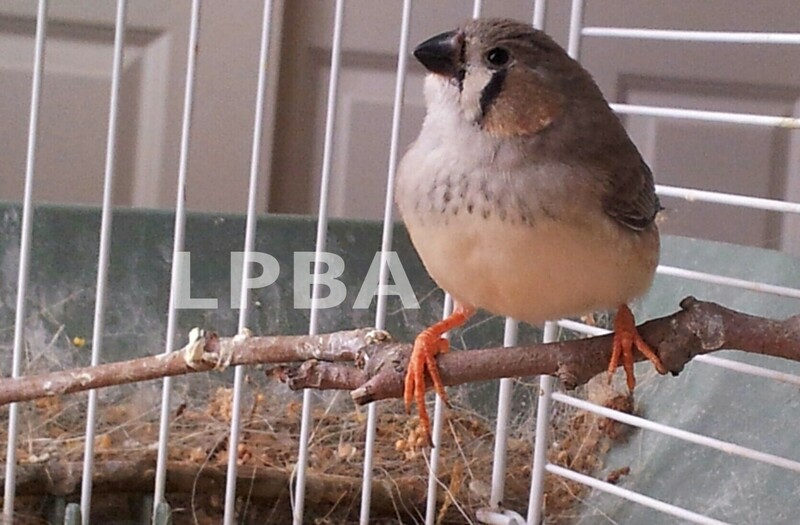 I so appreciate all your help, you are truly the Finch Queen!!! 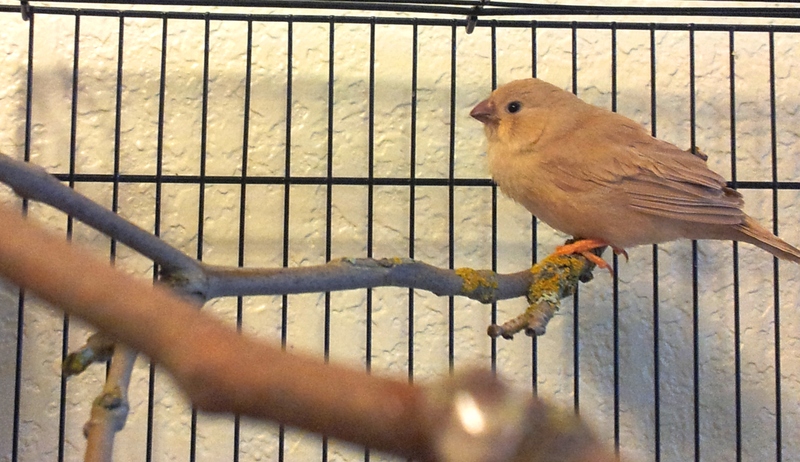 Looking forward to sharing more finch related stories. Jini I am very glad to hear it! I just knew they would get along. She’s too pretty to stay angry with! 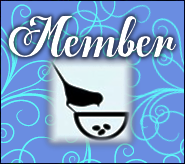 It’s been a real pleasure to have met and helped you! There are so few customers that are as joyous and kind-hearted as you. As soon as it settles down here, I’ll have to make another trip out to give you the feeder and some extra treat cups I found. Feel free to email me whenever, and if you need anything! Sent you an email, Sarah! I’m amazed, I have to admit. Rarely do I come across a blog that’s both educative and interesting, and without a doubt, you have hit the nail on the head. I am very happy that I found this in my hunt for something relating to this. Nice site. I learn something new and challenging on websites I stumbleupon everyday. It’s always useful to read articles from other writers and practice something from other web sites. An outstanding share! 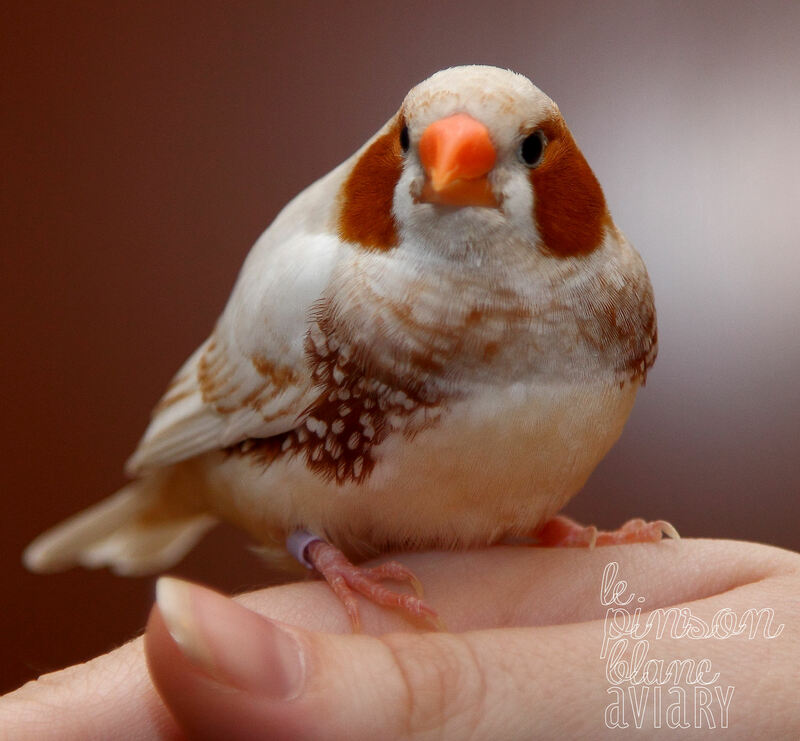 I forwarded this site onto a co-worker who was doing a little research on finches. Thank YOU for the information! ! 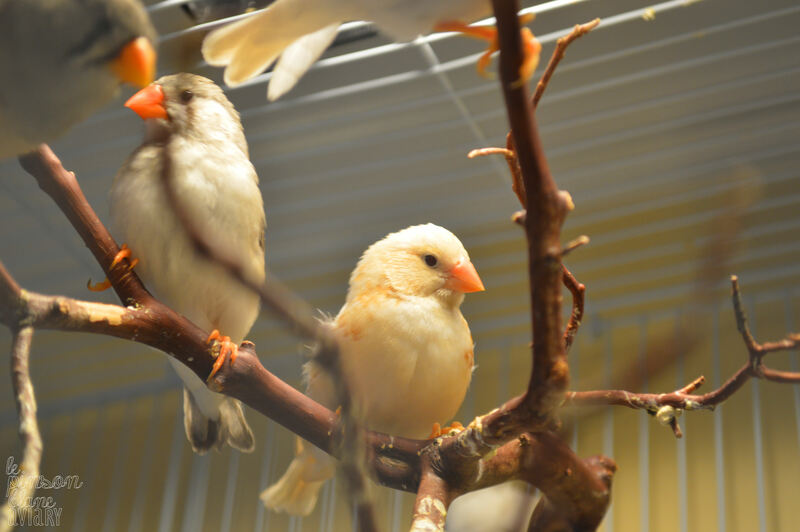 But yeah, thanks for spending some time to talk about finches here on your internet site. 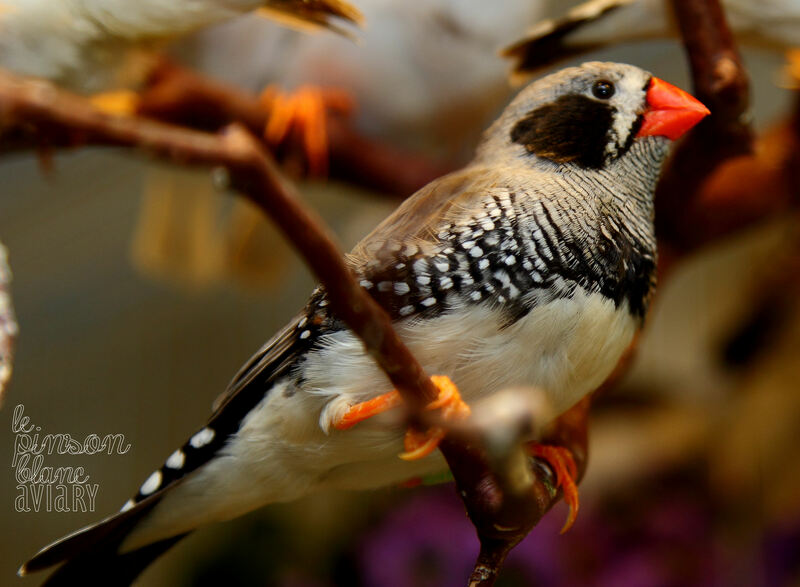 You have a fine way of describing finches, and pleasant paragraphs to obtain information on them. Hi! 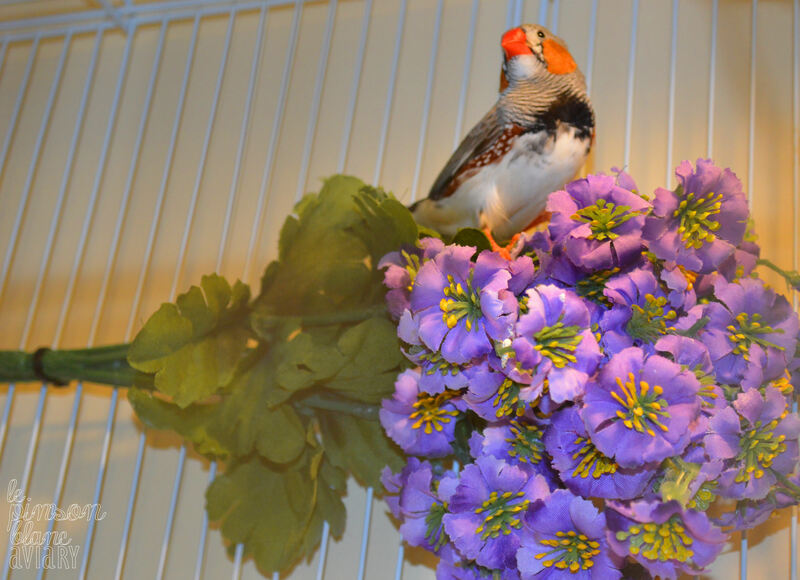 I’m in Bellingham, looking for a gouldian female- I’d be open to any variation you have. 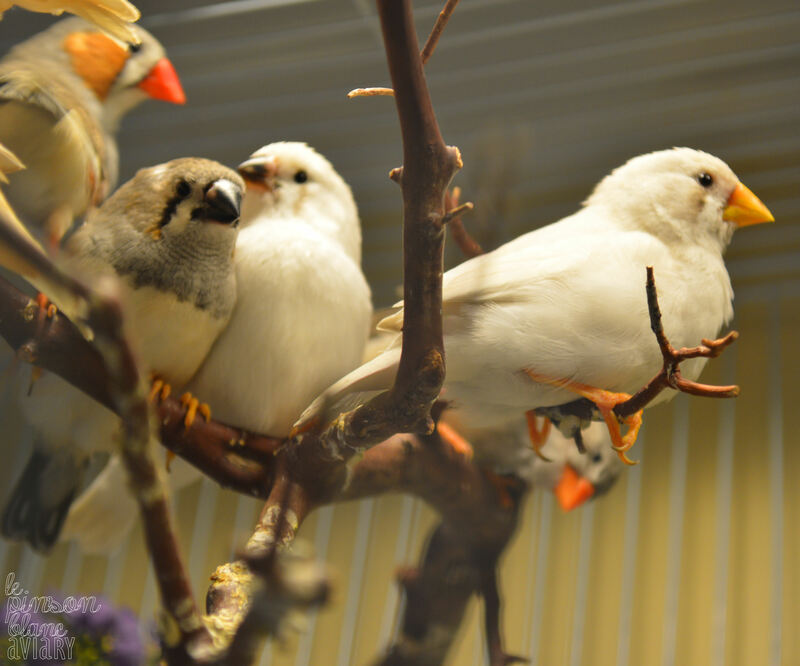 Right now the Gouldian flock is finishing up their resting period and will begin breeding again soon. 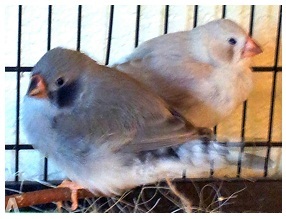 They recently completed their annual molt and shed almost all of their feathers in the process. As a result their plumage is better than ever, but this cycle also takes its toll on their strength and immunity. For their protection against illness or weakness it’s important to allow them an ample time to rest afterwards before beginning to breed. That being said if you’d like me to notify you via email as soon as their offspring have hatched and are being raised I can easily do so! Let me know & I’m looking forward to hearing back from you soon.